It has been a bad week for Tottenham Hotspur. The 1-0 loss to Manchester United last weekend was compounded by the injury sustained by Harry Kane. There were early hopes that the damage to Kane’s ankle would only be short-term but scans have shown that the club’s key man and top scorer will be out until March. Losing a player with 14 Premier League goals is tough enough but Spurs’ situation is made worse by the absence of Son Heung-Min. The forward has eight Premier League goals and five assists of his own but has joined up with the South Korean national team to take part in the Asian Cup. Son will miss anywhere from one to five matches depending on his country’s performance in the tournament. With the two top scorers missing and Vincent Janssen out in the cold, Spurs are left with third-choice Fernando Llorente to lead the line. Son and Kane have scored almost half of Tottenham’s Premier League goals this season while Llorente has bagged just one in his 18 months in North London. The former Swansea City man is hugely experienced but isn’t exactly a perfect replacement for either player. 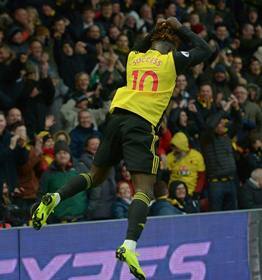 Fortunately for Tottenham, the transfer window is open so the club has a few weeks to try and find an alternative and Watford star Isaac Success could be a good fit. The Nigerian forward is back and playing well at the London side under new manager Javi Garcia. While Fernando Llorente is far more comfortable with the ball in the air than at his feet, Isaac Success is more of a dribbler and certainly has a higher work-rate than Spurs’ 33-year-old forward. Success would have impressed Tottenham when he starred in a League Cup match against them back in September. The Nigerian international found the net twice that night – once in the first half and again during the penalty shootout. He’s quick, good on the ball and certainly works hard enough to play in a Pochettino team. There is also the bonus that he has Premier League experience and a transfer would just involve a swift move across London. There are downsides to this, of course. Success isn’t exactly a goal threat with just three goals for Watford this season in all competitions but there is more to an attacker than their goal tally. The player would surely jump at the chance to play for Spurs but after signing a new deal with Watford last summer, a permanent transfer would be difficult. Perhaps a loan move until the end of the season is a better solution. Mauricio Pochettino faces a selection dilemma in the coming weeks. With Harry Kane out until March and Son Heung-Min away in Asia, the introduction of Fernando Llorente could force a change in play style. However, the transfer market is open so Pochettino could look to make a short-term signing to solve the problem. Watford’s Isaac Success would allow Tottenham to play in a more natural way and wouldn’t cost the world. It’s an unlikely transfer but one which could work out well for all parties on a short-term basis.